With the addition of new voltages, AP22M pilot lights are gaining attention from new and old customers alike! 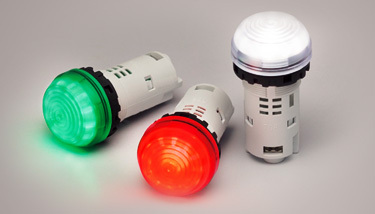 Using high-intensity LEDs to provide clear visibility even in direct sunlight, these pilot lights are great for applications in dirty environments or with high ambient light levels, such as waste water treatment plants, car washes, and solar or outdoor control panels. Available in six vibrant color lenses or a clear lens, AP22M pilot lights are 100 times brighter than a standard pilot light when viewed from the side!